Love is a tendril of a cartoon smell that wafts out and lifts you (or yanks you) up, like a golden-white tendril of the scent of the lemon pound cake, currently baking in real time here in the peacefoodlove kitchen, in Connor's honor. Just because the boy loves lemon pound cakes. You've never seen the look of gratitude a single crumb of golden lovingkindness can elicit, until you've seen a face like that, one that says, "You made that for me?" (and he's 15, so wonder is no mean feat). Maybe you cook for people, and you know. My ampersand-children (step isn't the right word) are coming, and I have a tendency to bake and clean myself into perfectionistic corners in anticipation of these infrequent visits. In fact, it's been Astral Weeks since they've been here. I could write you 108 posts about this Van Morrison album. It's that beloved and it stretches across every experience I have had, in some way or another, since I was 20 years old, when I first heard and wore out the CD. Periodically, still, I pull it back to me--or me to it--when I need it. Love is a tractor beam of mutual resonance like that. I must have needed it, because I was running around fiendishly vacuuming after putting in a lemon pound cake, getting pretty caught up in getting things "perfectly hospitable"--my biggest trap when I'm anxious about how things will go. Unfortunately, the very same methods you use to get you closer can be used to try to squirm away. Even your best methods can stick you!--I don't care how deeply you butter and flour the form. . .er, pan. All of a sudden--maybe I was caught by the light or the cord or the way the smell of a cake unfolds and walks gently across the floorboards to you in a farmhouse--I happened to turn around and look behind me, and see the cord, which had somehow twisted (or untwisted) itself into a perfect heart. The cord, I tell you! And don't even get me started on good-emptiness (which isn't a vacuum) and making space. Some day, these mettāphors will stop surprising me--maybe. I don't think they'll stop spring up--or back, like a cake that's done. I pretty much dissolved, just the way the tiniest dram of lemon juice will completely liquify powdered sugar and make icing. I'm pretty sure that all appliances and songs leave love notes for us to decode, but we're usually charging on ahead. 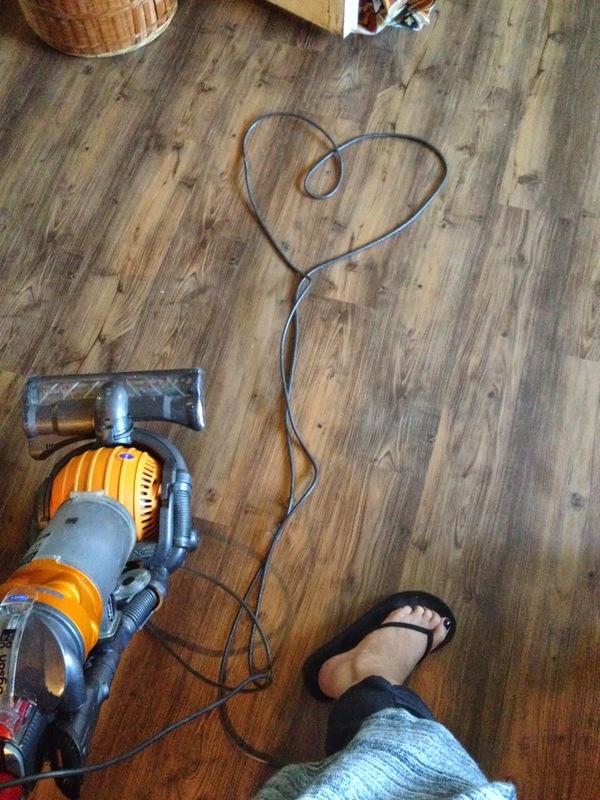 And this one said: taking care of your love isn't a zoom ahead with a Dyson and a perfect pound cake-type activity. It's a stop right here and now and here it is, the Now, iced in sweetly like being between two pieces of warm pound cake. So I was pulled in here to the kitchen to try to recount it for you (okay quickly, with T-50 till arrival). Love will find you. It doesn't matter what you do or how hard you do it. You can't clean your way out of it, and I can tell you that you can try to eat the evidence of your own hunger for it, only to find another tender crumb you missed, on the floor of your heart. You can do all your methods to get closer, or you can do them all to try to get away, and end up, right back around the plate. In silence easy / To be born again. Okay, not so much with the silence around here, but if you weren't born again, you couldn't hear the screaming coming from mudroom, Otto with gritty eyes from the sandbox, begging for the kind of help only you can give. Ava, crying over accidentally cutting a caterpillar in half while pruning the tomatoes.You couldn't see--or serve--the mettāphor.